Convertibles equal fun right? You bet they do! 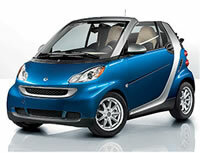 2 seater convertible cars are your escape from the usual and predictable. A license to (temporarily) forget about your responsibilities because with only two seats this car lets you dream. Put the top down and let the wind race through your hair while you let your imagination run wild. Pick your favorite 2-seater now. You deserve the freedom to be one (or maybe 2) with the road.